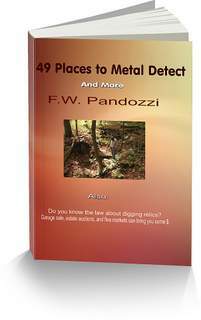 Wisconsin lost treasure sites are listed on this page. However, I cannot promise that this information is completely accurate. As treasure tales go, because they have been passed down through many years, certain elements of the lost treasure story may have been altered, either intentionally or otherwise. Good luck! And have fun in your search for Wisconsin lost treasure. The Great Milwaukee Fire in 1892 destroyed 26 acres of of homes. Some of the ruins from this fire still stand. Over the years treasure hunters have uncovered treasures and relics left from the fire. The shores along this park have produced silver coins from the nineteenth century. The coins may be coming from the ships that sank over the years. Located in Lake Superior. Gold coins have been found on the shore of Lake Superior. They are probably from the wreck Benjamin Noble, which was carrying $100,000 in gold coins. Located in Lake Superior. A British officer, during the Revolutionary War, buried a chest of silver coins somewhere on Sand Island. Located in Lake Superior. During the Revolutionary War British soldiers buried $128,000 in gold coins on this island. They buried the coins in an iron box to keep it from the Indians. Somewhere on Otter Island, in Lake Superior, William Wilson, a recluse, buried $90,000 in gold and silver coins. The treasure was buried near his cabin. Somewhere on Hermit Island in Lake Superior, Frederick Prentice supposedly buried a large treasure near his home in 1895. The house is no longer standing. Located in Lake Superior. During the Revolutionary War, British soldiers were stealing from local residents. The soldiers then buried numerous caches on Stockton Island. Located eight miles southeast of Mercer, on route 51. In 1934, the gangster John Dillinger was reported to have buried $700,000 in paper currency in the woods approximately one quarter mile behind the lodge. When the very well to do businessman R.C. Bennett died in 1950, he wrote out instructions for his wife to various treasures he had buried. She found 60 tin boxes that held a total of $40,000. They were found beneath the basement floor of their home. Supposedly he had buried another million dollars that has never been recovered. Pay attention to the law before digging for lost treasure. For more information on where and how to research for lost treasures, visit my research page. Wisconsin lost treasure may be located in ghost towns.